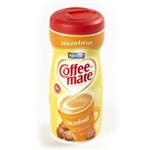 Coffee Mate Hazelnut Creamer 425g Coffeemate Hazelnut, Cholesterol Free, Lactose Free (15 oz canister/Each) Linger over a warm cup blended with the nutty sweetness of Hazelnut. Creamy and richly satisfying, this popular flavor makes a flavorful cup that's always a pleasure. Sugar, Hydrogenated Vegetable Oil (Coconut and/or Palm Kernel and/or Soybean), Corn Syrup Solids, Less than 2% of Sodium Caseinate (a Milk Derivative, Dipotassium Phosphate, Mono- and Diglycerides, Sodium Aluminosilicate, Salt, Natural and Artificial Flavour. Contains: A Milk Derivative. At last I can get this in the UK. Perks up my coffee. The product was fresh and in very good condition. 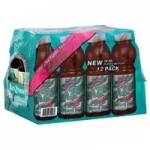 Will order again in different flavours. Thank you! 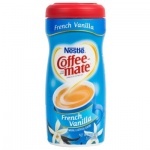 Excellent product - coffee not the same without Hazelnut CoffeeMate! !